You applied for a Fulbright Study/Research award to Germany (West Germany, at that time). Why did you select Germany as your host country? 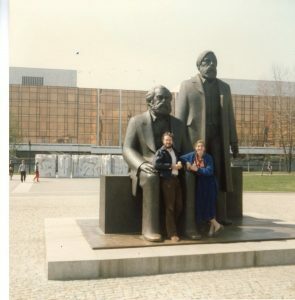 My bachelor’s thesis was on Ostpolitik [the normalization of relations between West Germany and Eastern Europe, particularly the German Democratic Republic (GDR, or East Germany)], while my master’s thesis was titled “the German Nation in Honecker’s Germany.” Germany was the only logical host country for further research on this topic. As East Germany was not an option, West Germany got the nod. My top choice of city, however, was Berlin. A very fortuitous choice, as it turned out. 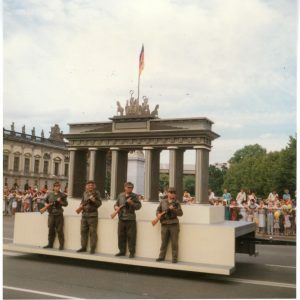 You were in Germany as a Fulbrighter from September 1986 to November 1987, roughly two years prior to the fall of the Berlin Wall, and your research project focused on a comparative study of Berlin’s history on both sides of the Wall. Could you describe your experience investigating that topic there at that time? 1987 constituted the 750th anniversary of the first historically documented mention of the city of Berlin. 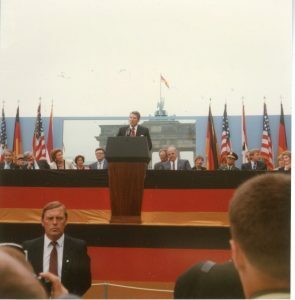 Both sides of the Wall planned extensive celebrations, including historical exhibitions, parades, speeches (including the famous “tear down this Wall” speech by President Reagan), seminars, and other cultural events. It quickly became clear that the two opposing ideological views of a common history (until 1945) followed by a harsh division were symbolic of the division of the country. 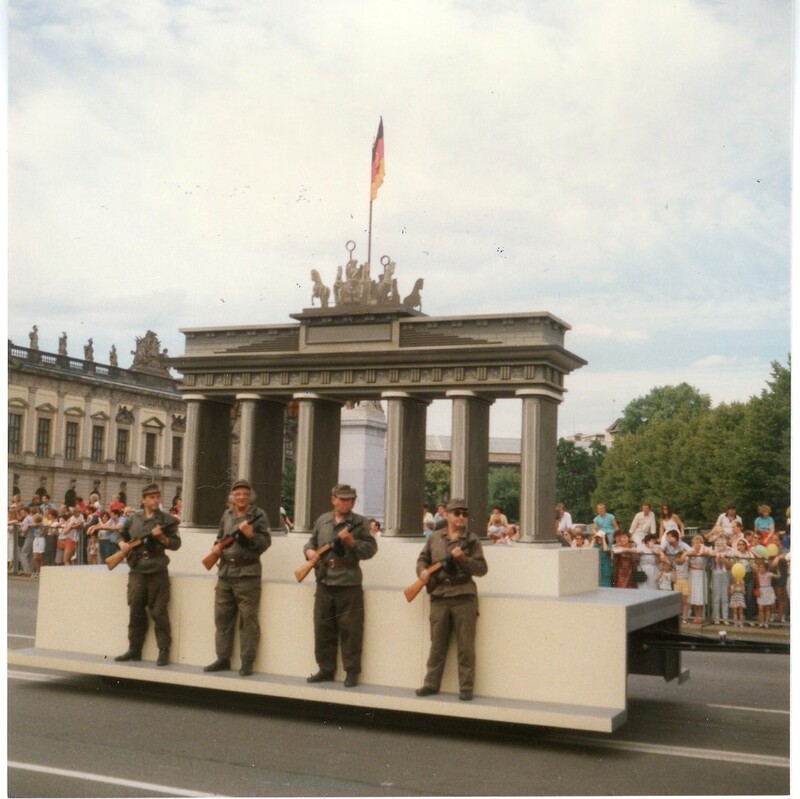 In particular, the GDR’s contradictory attempts to both ground itself in Germany’s common past (at least those aspects that the socialist regime could consider positive) and consolidate its status as an independent state and “nation” were clear to anyone observing the celebrations. Being based in West Berlin, I was able to see events unfold as the anniversary year rolled on, comparing how East and West interpreted differently common events and how much more focus the East placed on developments post-1945 (even celebrating the construction of the Berlin Wall as a victory for peace), as opposed to the West’s emphasis on German unity and the time of the Weimar Republic. Being there to attend events on both sides of the Wall and discuss their significance with locals was priceless. Aside from your academic experience, how did you engage with your host community? How did you share your culture with them, and what did you learn about German culture? In addition to attending lectures and seminars at the Freie Universität [Free University of Berlin], I lived with a host family, with whom I had many fascinating conversations and outings. 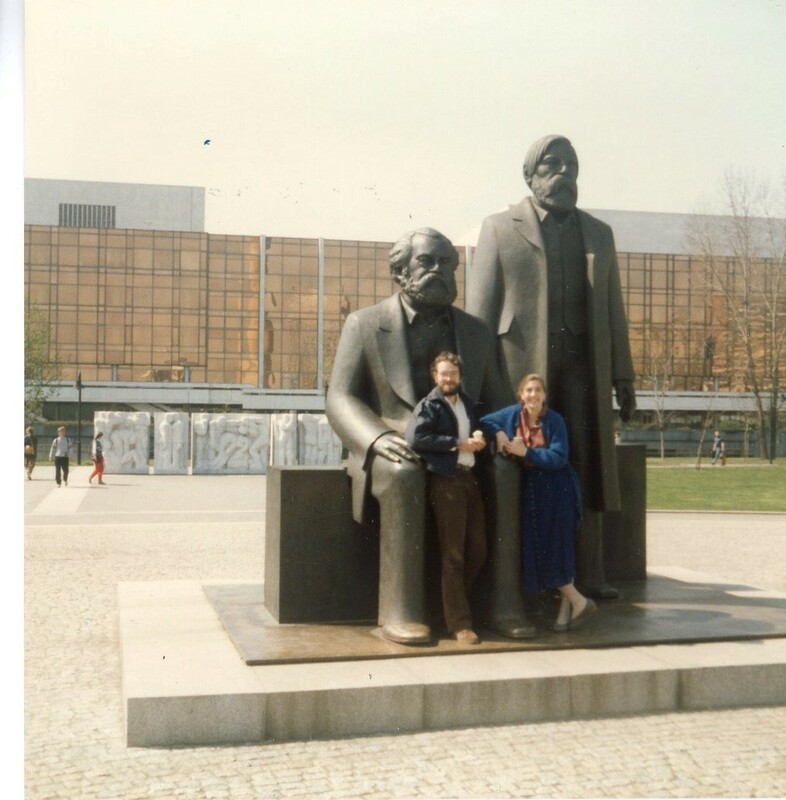 I also managed, through other Fulbrighters, to meet several people living in East Berlin, allowing me to get their perspectives on the city and the anniversary events. 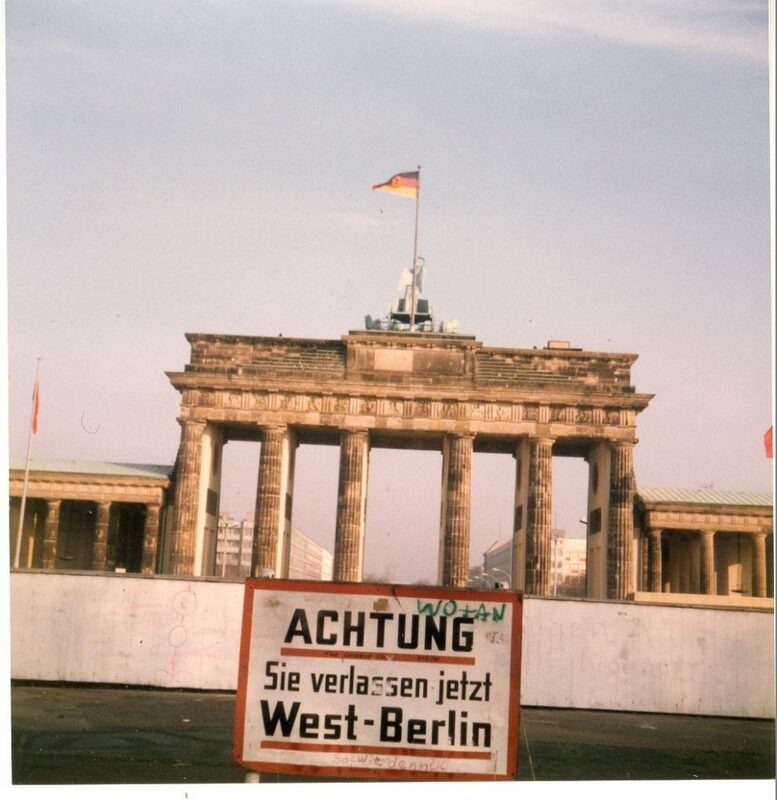 In addition, I took advantage of a loophole in East German regulations to allow me, as a “resident” of West Berlin, to take day trips via East Berlin to cities in the GDR. Thus I, unlike other Americans at the time, could travel extensively to cities like Dresden, Leipzig, Erfurt, Potsdam, Brandenburg, Schwerin, Greifswald and Frankfurt an der Oder. The vast majority of people I met on those trips had never met an American before and were fascinated by my perspective. I, in turn, was delighted to learn more about life in the GDR from the people actually living there, outside the show window of East Berlin. Shortly after completing your Fulbright, you entered the U.S. Foreign Service in 1988 and have now served as a U.S. diplomat for thirty years, including a posting in Bonn, Germany in the early nineties and now with the U.S. Embassy in Berlin since 2015. Tell us about your transition from life as a Fulbrighter to life as a diplomat. How has your Fulbright experience helped you in your profession? I spent the three intervening months between my Fulbright Program and starting with the State Department reconnecting with my parents and reimmersing myself in American culture. There were several opportunities during that time to share my Fulbright experiences with the people of Texas (where my parents lived at the time). Once in the Foreign Service, I found that the Fulbright experience helped me understand different cultures and perspectives in Africa and the former Soviet Union. My assignment to Bonn was just after the reunification of Germany, so the insights gathered during my Fulbright program were particularly helpful in understanding the struggles Germany experienced in integrating “Ossis” (from the East) and “Wessis” (from the West). I have spent most of my 30-year career focused on the post-Soviet space, drawing heavily on my Berlin experiences to help understand the difficulties of the systemic transitions those countries have experienced. Fulbrighters often describe the lasting relationships and connections that they build with their host community. What are some of the connections that you made during your Fulbright experience, and how have you maintained those over the years? In addition to an undying love for Berlin, I made several close friends during the Fulbright experience who have played major roles in my life over the years. Maintaining those contacts was more difficult prior to the advent of social media, but in several cases, we kept finding ourselves in the same places (Bonn, Moscow, New York/Washington) in subsequent years. As a Fulbrighter, how would you describe the impact of the Fulbright Program on your life? In addition to the connections I made during the Fulbright year, the perspectives I gained from being able to travel freely between East and West have been the most valuable. As the Soviet world opened up, I was able to use this background to help me serve more successfully as a diplomat in Kazakhstan, Russia, and Georgia, as well as at the Organization for Security and Cooperation in Europe. During your career as a U.S. diplomat, what kind of impact have you seen the Fulbright Program have around the world? It is truly amazing to think of all of the very influential people across the world who have benefitted from exchange programs like Fulbright. Fulbright has made a difference in the lives of countless people who have made a difference in the world. One unique element of the Fulbright Program is its binational approach, in which partner governments work with the United States to set joint priorities and shape the program to meet shared needs. An excellent example of this is the binational German-American Fulbright Commission, which has overseen the exchange of more than 45,000 Germans and Americans since its founding in 1952. What role do you think the Fulbright Program plays in strengthening the overall bilateral relationship between the United States and Germany? Fulbright plays a vital role in promoting German-American friendship and understanding. The program has touched so many people, who as a result have a much better understanding of the other country. This understanding results in a stronger bond between the two nations. The German-American partnership is so important in so many ways, and exchanges like Fulbright have helped keep the partnership vibrant across the decades. What advice would you give to students who may be thinking about applying to the Fulbright Program today? Apply! The experience of a Fulbright year is priceless, providing exposure and unique experiences that will benefit the Fulbrighter for the rest of their life. Participation also helps to promote U.S. outreach to the world and improve the world’s understanding of the United States. Everyone stands to benefit.